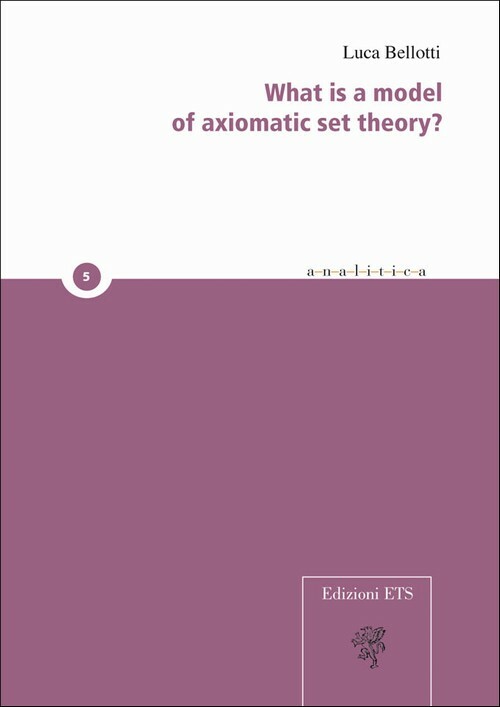 What is a model of axiomatic set theory? This is a work in the philosophy of mathematics, about some philosophical issues connected with set theory, especially the conceptual question of the semantics of set theory. Specifically, some aspects of the classical philosophical question concerning the notion of model of axiomatic set theory are discussed: the conceptual (as opposed to mathematical) circularity of the usual set-theoretic semantics of set theory, the Skolem 'paradox', the natural second-order alternative to the 'weak' first-order formal systems, the relationship between the syntactic metatheory and the semantical metatheory of axiomatic set theory, and the question of its consistency. The standpoint is not Platonist, but in a broad sense Neo-Kantian, identifying the crucial feature of mathematical 'reality' in the objectivity of concepts, understood as something which by its own essence holds in an autonomous realm of pure validity. The actual practice of the mathematical study of models of set theory is taken as a datum for philosophical reflection. The contribution of this book to the literature in the philosophy of mathematics is a discussion of some classical problems in the field in the light of an overall point of view which has been rather unusual in the last decades, at least in the literature in the analytic tradition in philosophy. All those who are interested in the history and the philosophy of set theory can find something of interest in this book, and some of the problems discussed, taking set theory as the object of a case study, have broader scope and interest. Luca Bellotti is Assistant Professor of Philosophy at the University of Pisa. His main interests are in logic and philosophy of mathematics. He is the author of the book Teorie della verità (ETS, Pisa 2008) and of a number of articles in the main journals in the field.